Tonight's 6 miler was sweet, sweet redemption compared to that little adventure two nights ago. Went the same route and then some, and nothing out of the ordinary happened. It barely even rained! But, there was this one lady walking down one of the neighborhoods I run in and she was searching for something. As I ran by I said "good evening" and she responded with "hey, have you seen a dog running around here?" (fantastic, a stray dog that perhaps likes to play tag with random strangers?). "Nope, sorry." And then I turned my music to the lowest possible volume and proceeded with my run on high alert. Thanks lady. In fact, yesterday's treadmill run was boring too. Just some hill intervals and a lovely little coughing fit after the run. So, yeah. I'm not really interesting today. Sorry guys. 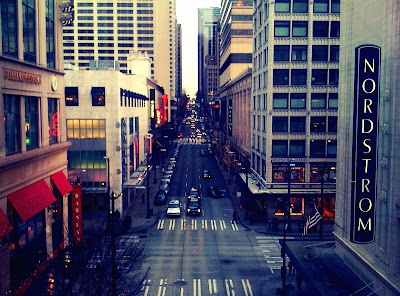 Instead, here's a picture I took of one of my favorite places: Seattle. Hey I was worried and you picked on me. LOL!! Great picture. cant wait to run with you...hope we dont see an rabid dogs..
Love the photo. Can't wait to see Seattle for myself! Good luck with the "Million Inch Run"! I am so excited to hear about Saturday's run! I will be thinking of you guys as I run the icy streets of VA. Good Luck! eek, dog on the loose? No one digs that. 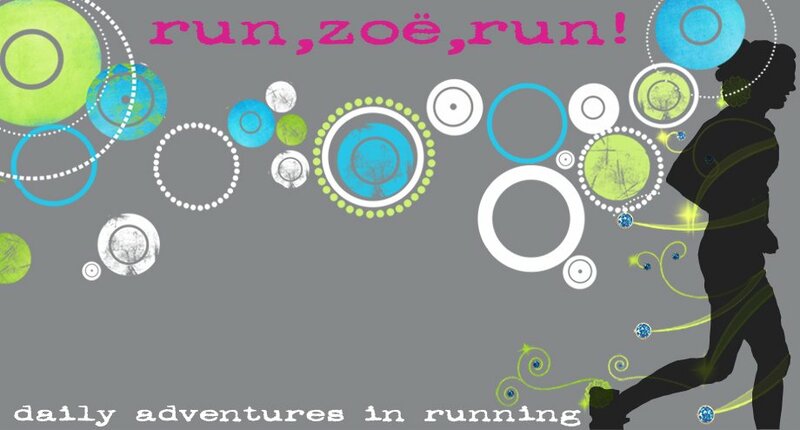 That's an amazing run, Zoe! Glad your recent run was a winner despite the interruption. Good luck at your race this weekend! Uneventful runs are great! Good luck this weekend! I'm excited to hear all about it. I think that's one reason why we read blogs. We all have uneventful, even boring, runs. So we like to read about other peoples (mis)adventures until our next poop, or 'Stranger Danger!!' post. Glad you had a good one. Those redemption runs always feel good. Got my back the other day. LURVE it. It's perfect for my running gear and laptop that I take to school. Paired it up with a new purse and hopefully no more forgetting stuff b/c I carry 5 different bags to school each day. Thanks girl! You're the best! I get chased by dogs often on my runs. My neighborhood doesn't have a lot fences. Did you make up the quote on your header? I really like it.